School admission and withdrawal registers are considered one of the most useful records for family historians. They provide specific details of new pupils entering a school along with personal details about the pupil and their families. The main problem with these records is the fact that by their nature they are voluminous. Often in the past schools have thrown them away because they did not have the space to hold them. It is for this reason that various school collections do not have as many admission registers as log books. As we discussed yesterday log books were viewed as a vital part of each school’s record keeping and efforts were made to retain these somewhere safe. Admission and withdrawal registers, however, were regarded as ephemera that had little useful life beyond the year that they were originally concerned with. Those that have survived are an invaluable source of information for that school. Here are some examples from our collections. This example comes from Drymen School and shows just how useful the information in an admission register can be. Have a look at admission no 688. This entry concerns pupil Norah Clarke. From the register we can ascertain that she was admitted to the school on 22 November 1915 aged 9 years. We also know that she lived at Ivy House in Drymen and that her last school was in Quebec, Canada. 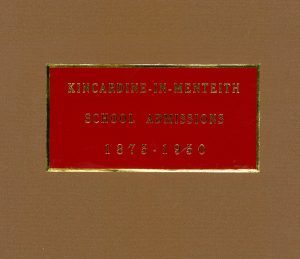 Some admission registers provide more information than others. This example (no. 503) from McLaren High School shows that on 30th June 1909, Reginald Hollyer left school ‘to enter business’. If we look at entry 40 in the Lecropt School admission register we can see also see the examination dates for pupil John Morrison. Please also note that due to data protection, admission and withdrawal registers are generally closed for 100 years if they contain sensitive information.